Be it oily or dull skin, at the end of the day they both require an efficient and gentle cleanser. The fluid circulation needs to be stimulated while the sebaceous glands need to be smoothed. Kronokare's ginger formulated gentle cleanser soap delivers to the skin some sebum regulating ginger extracts and some moisturizing glycerin. The freshness and glow is back on your skin. You asked for detox? We serve it on the rock! Explore the entire range of Soaps available on Nykaa. 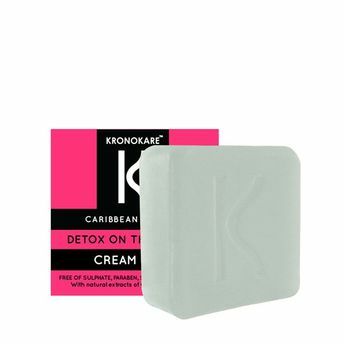 Shop more Kronokare products here.You can browse through the complete world of Kronokare Soaps .Alternatively, you can also find many more products from the Kronokare Detox On The Rocks! Cream Soap range.